The governments of the Northwest Territories and Nunavut have joined forces to create a mandatory curriculum for high school students to learn the legacy and history of residential schools. "We all need to realize this very, very key point: that residential schools are not aboriginal history, this is Canadian history based on Canadian laws that aboriginal people had no say in," said Marie Wilson, one of the three commissioners of the Truth and Reconciliation Commission. Teachers, politicians and leaders from across the two territories gathered in Yellowknife for the curriculum’s launch. 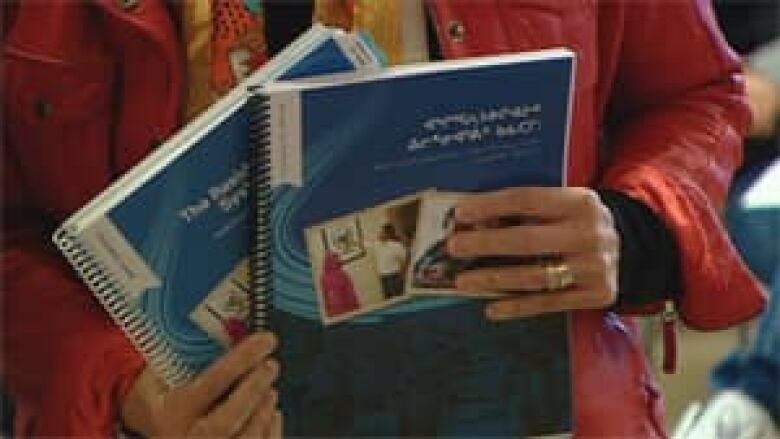 The 25 hour curriculum has 12 activities, each of which are built around an interview with a former residential school student or leader or a national piece of news, such as Prime Minister Stephen Harper's apology to former students in 2008. "The learning activities in this unit are built on the voices and the stories of the former residential school students and others… they did this disregarding the pain and grief it caused them personally, because they wanted us to know," said Jackson Lafferty, the N.W.T. Minister of Education, Culture and Employment. Students will follow an arc starting with how aboriginal children learned and were independent before residential schools. Then the course moves into the period when children were forcibly taken from their homes and families and sent - often hundreds of miles away - to the church-run schools. Many were sexually, physically and psychologically abused. Most lost their culture, traditions and language. However, the arc ends on a positive note. John Stewart, the coordinator of social studies and northern studies, helped to develop the course. "The message of everyone that we interviewed and gave us guidance was 'you can't leave students in that dark place'. We need to show them some of the many, many opportunities for hope, for healing, for change, that are current now," said Stewart. Over the next two days, social studies and northern studies teachers will prepare to teach teenagers the new program in Nunavut and the Northwest Territories. Many hope the curriculum will reach even further. "Nunavut and Northwest Territories are pioneering this. At this point and I am so very proud of that, and I truly hope that it will expand to the rest of our nation," said Eva Aariak, the premier of Nunavut.